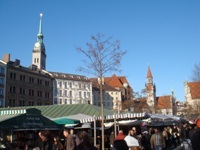 To start your English city walking tour to Munich, you can either choose to be picked up by your tourguide at a hotel or any other location of your choice within Munich, or you can decide to travel to the city centre on your own. In the latter case, your tourguide will await you at the Reichart pastry shop on Viktualienmarkt square (don't worry: we will send you a detailed map with all necessary information on how to find your tour guide after having received your booking!). From here, you will discover the most important sights of the old town of Munich by foot with an experienced and entertaining local city guide. Have a look at Saint Peter's Church, at the Old Town Hall with the toy museum, the New Town Hall with the "Glockenspiel", the "Mariensäule" Column and the Fish Fountain. Carry on to the Odeonsplatz and follow your guide through the gardens and courtyards of the royal residence, continue past the Trinity church towards the "Frauenkirche" Cathedral and maybe take an elevator ride to its top at the end of your tour. The exact tour program depends on your individual interests and wishes and can be agreed upon either beforehand at the moment of your tourguide booking or when you meet with your Munich tour guide.